"We just didn't believe them when they told us... Boy were we mistaken. My family and I rented the Kayaks and made our way out for the day. Within a couple of yours there were a group of dolphins surrounding our boats. IT WAS AMAZING!!!" 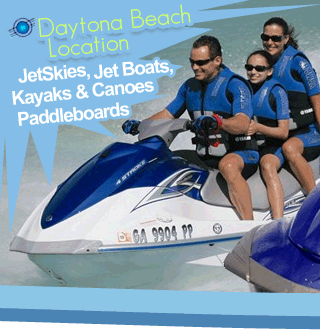 Dolphin & Manatee encounters are very common within the Florida Intracoastal Waterway. So easy to find, all you have to do is cruise around the mangroves or shoreline and you are sure to spot these wonderfully playful mammals. 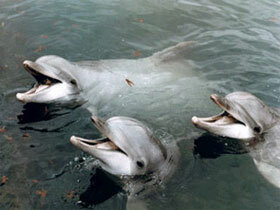 Dolphins are often misinterperated as sharks... Truthfully, dolphins are almost as common as people on the waterway. Very easy to spot, look for a dorsal fin (top fin) making slow archs along the waters surface. The fins rise up, break the waters surface and then slowly arch back down underneath the surface. Often times there are smaller baby dolphins traveling with their mothers. If you're really lucky, these playful creatures will jump out of the water and do flips, just like in the movies! Manatees are all together different mammals... The creatures poke along the shoreline very slowly careful to only expose their nose first and then gradually hump back downwards to expose their back and tail fin. 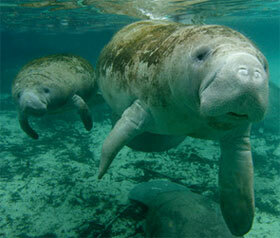 Often times with manateees, they travel in packs and usually reside in very calm, warm water. Manatees are so friendly, vacationers who choose to approach them are usually awarded with quick touch before they slip back underneath the water. Very loveable creatures indeed! 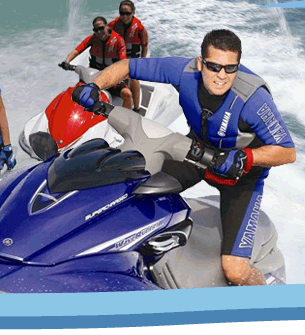 Keep your eyes peeled while cruising along on a jetski nice n' slow and you're sure to see many dolphins and manatees within Florida waters. GOOD LUCK!